Anytime you are building or decorating outside your home, your personal aesthetic choices come into play. These days, materials vary widely, so there are plenty of chances to produce a look that you can not only live with but love in the long run. 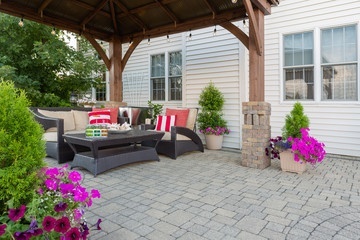 One choice you’ll probably find yourself facing, whether you’re finishing a garden spot, making an outdoor patio hangout or landscaping around a deck, is whether to use natural stone or concrete pavers. You might be constructing an apron around the lap pool at your Atlanta area home, or you may simply be putting in a few solid stepping stones that will allow you to get from point to point without stepping on and stressing the grass you’ve planted. There are a few key differences you’ll need to be aware of before you make your final decision. First, you should factor in cost. If you’re trying to save a little money on a small endeavor, or if you have a very large project and cost is a factor, concrete pavers may be the way to go for you. 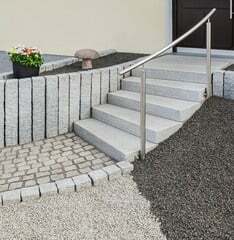 Because they are manufactured, there is simply more availability, and the cost can be significantly lower than stone. If you want to make an investment that you’ll be living with for a long time, however, stone may be the way to go. If the look of natural stone is the only thing that will satisfy you, it’s certainly fine to splurge on something that you will look out your back window and see day in and day out. Although concrete pavers come in many shapes and colors and can be quite attractive, there’s nothing quite like the real thing for some people, and that’s when stone is a must. Second, think about the replacement factor. Because concrete pavers are usually mass produced, it will likely be much easier to replace one should it crack than it would be to try to replicate the exact look of a damaged stone tile. Third, consider ease of installation. Because pavers are often made in the same fashion as bricks, they can often be more easily installed than can natural stone elements. If you have a host of elaborate structures in mind, such as curving stone walls or intricately-linked flower beds, stone pavers may be the better option. It’s best to go in to the project with a specific plan in mind and then consult with a local expert who can guide you on the best option for your particular situation. Don’t be afraid to show up with drawings and an inspirational photo layout when you look for pavers in Johns Creek, GA. The more your potential installer knows about the look you’re going for, the better informed he or she can make you in terms of materials, cost and project time frame. Contact a landscaper at Stoeckig Landscape Group to design and plan your new backyard today!